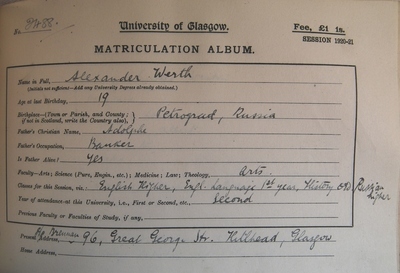 Alexander Werth, a renowned war correspondent and writer, graduated MA from the University of Glasgow in 1922. He was born in Petrograd (St Petersburg), son of Adolph, a banker, with whom he fled Russia before the Revolution of 1917. Werth first enrolled at the University in 1919, attending classes in English, French, History, Russian, and Moral Philosophy, graduating MA in 1922. Among his lecturers of History, for which he received a first-class honours was Professor Dudley Julius Medley. While an undergraduate, he won the Bradley Medal, awarded annually to the most distinguished English Literature student. Werth continued to attend classes until 1924 in Comparative Literature and Political Economy and Philosophy. After graduation, he became a sub-editor and correspondent for the Glasgow Herald (1927-28), and continued as a correspondent for the Manchester Guardian in Paris, the Sunday Times, the New Statesman and the New York Nation. In the 1930s, Werth was based as a correspondent in Berlin and Paris, and during the war years, he remained in Moscow as war correspondent for the BBC, and the Moscow correspondent for the Guardian newspaper (1946 to 1949). He later returned to academia, acting as a senior Simon Research Fellow at Manchester University (1953-55) and Visiting Professor of History at Ohio State University (1957). The author of some 15 books on Russia and France, Werth produced the volume Russia at War 1941 to 1945, (London, 1964), on which William L Shirer commented "the best book we probably shall ever have in English on Russia at war."